By Bernard F. Laya, D.O. and Regina C. Nava, M.D. This chest radiograph of a 27-year-old woman presenting with severe difficulty of breathing (A) appears grossly unremarkable. A high resolution chest CT scan was obtained (B), which reveals variably-sized cysts throughout the lung parenchyma with thickened interlobular septae, compatible with lymphangioleioyomatosis (LAM). Based upon these findings, an abdominal CT scan was performed (C), revealing a large, heterogeneous right renal mass with predominantly fatty attenuation. A smaller lesion with similar imaging characteristics is seen in the left kidney. Brain CT scan (not shown) demonstrated small subependymal calcifications. Overall constellation of findings is compatible with Tuberous Sclerosis. Pulmonary LAM is a rare disease affecting mostly women of child-bearing age. It also occurs in some patients with Tuberous Sclerosis. It is characterized by disorderly proliferation of smooth muscle throughout the lungs, causing destruction of lung tissue and leading to abnormal cyst formation. Dyspnea and pneumothorax are the two most common presenting symptoms. LAM is a slowly progressive condition with a poor prognosis. Treatment is difficult and is primarily supportive. Laya BF, Nava RC. 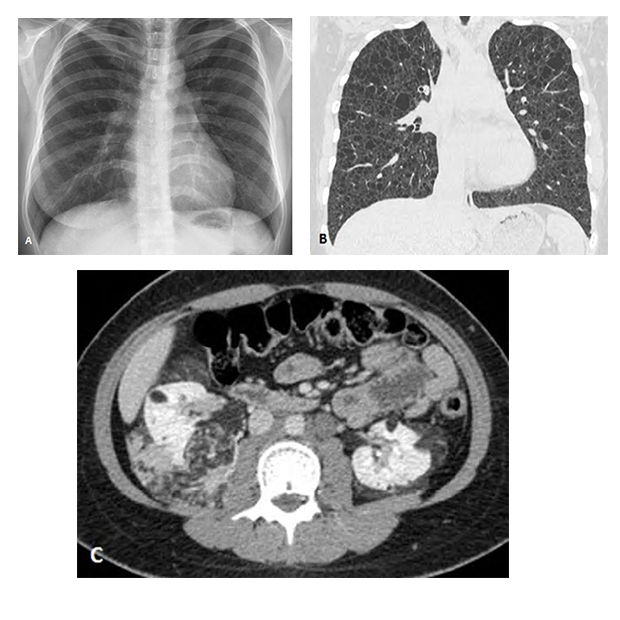 At the Viewbox: Pulmonary Lymphangioleiomyomatosis. J Am Osteopath Coll Radiol. 2014;3(2):35. Bernard F. Laya, D.O. and Regina C. Nava, M.D. Dr. Laya and Dr. Nava work with the Institute of Radiology, St. Luke’s Medical Center Global City, Taguig, Philippines and Dr. Laya also works with the Institute of Radiology, St. Luke’s Medical Center, Quezon City, Philippines.